Seventeen year old Cassia Reyes lives in an idyllic world. Everything is provided for: food, shelter, and education. In exchange, Cassia and her family must follow the rules. Everything is carefully mapped out based on data and statistics, and nothing is left to chance, including love. When young men and women reach the age of seventeen, they attend a Match banquet. At the banquet, the government reveals a match for each young individual. The matched young men and women then begin a supervised courtship that culminates in marriage when they turn twenty one. Cassia is pleased when she is matched with her best friend, Xander. At the Matching ceremony she is given a micro disc that contains information about her match. She watches it at home, and is shocked when the screen flickers another face is revealed, that of a young man named Ky. Ky is an aberration, meaning he cannot be matched, but Cassia is nonetheless intrigued. As she gets to know Ky better, she begins to fall for him and realizes that her society is not the perfect world that it seems to be. She must decide if she is going to follow the rules, or her heart. Based on the synopsis this book sounded very interesting, but I did not find myself enthralled by it. I was intrigued by the idea of a statistics based society, but I was not actively engaged by the characters. At first Cassia is ecstatic about her match to Xander, but she does a full 360 turnaround when she catches a glimpse of Ky at the end of her match video. All of a sudden, Xander no longer interests her, and I find that odd considering their supposedly long-standing friendship. I soon found myself bored with this book, and I struggled to get to the rather anticlimactic end. This book is clearly part of a series, so I may decide to give it another chance, but it’s sequel is certainly not at the top of my “to read” pile. This may just be a matter of personal preference, as I have no real complaints about the author’s style of writing. Reader’s Annotation: Cassia has found her love match. But what if it isn’t the right one? “Ally Condie is the author of the MATCHED Trilogy, a #1 New York Times and international bestseller. 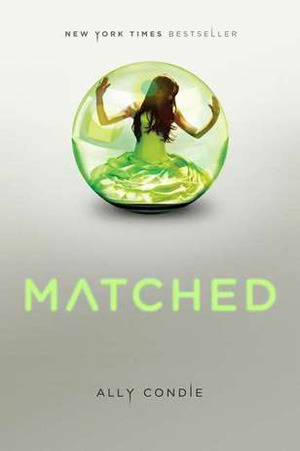 MATCHED was chosen as one of YALSA’s 2011 Teens’ Top Ten and named as one of Publisher’s Weekly’s Best Children’s Books of 2010. The sequels, CROSSED and REACHED, were also critically acclaimed and received starred reviews, and all three books are available in 30+ languages. Talk about what qualities make people an “ideal” match. Talk about the relevance of data in “sorting” people. Justification of Selection: This book demonstrates the danger of unquestioning conformity and the power of forging a unique identity.